The Hyundai Elantra has won the award for the best midsize sedan at the Car and Bike Awards 2017. 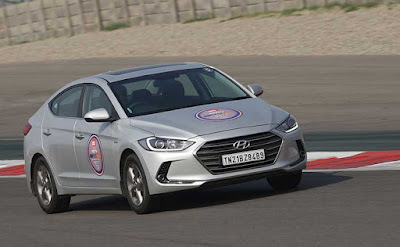 Hyundai launched the Elantra in a segment which has not seen much growth in recent years and car manufacturers have been shying away from launching new products. Skoda launched the Octavia to get things moving but still, the premium sedan segment didn't really take off, until Hyundai decided to bring in the Elantra this year. The 6th generation of the Elantra has been extensively worked on the design and styling bit. It's edgy and bold, compared to the older model. Hyundai has claimed that the new generation model is made of 53 per cent Advanced High Strength Steel (AHSS) that allows higher structural rigidity. This will improve both the driving comfort and handling. In addition to that, the car is now also 20mm longer and 25mm wider than the previous generation model. But Hyundai has worked extensively on the suspension of the car and when we found out how balanced the ride was when we drove it. It's more about providing a sporty ride and the Elantra does not disappoint. In fact it sets the ball rolling for what to expect from the South Korean manufacturer, not just in terms of ride and handling but also features. The car comes with a touchscreen infotainment display with Android Auto and Apple CarPlay, but only above the SX variant. Hyundai has also equipped the car with a host of convenience features like drive mode select, hands-free smart trunk, auto cruise control, keyless entry with smart key, armrest for both front and rear seats, and USB/AUX-IN/Bluetooth connectivity to name a few. In terms of powertrain options, the new-gen Hyundai Elantra comes in both petrol and diesel engine options - an all-new 2.0-litre petrol engine and a 1.6-litre diesel motor. while the petrol motor makes a class-leading 150bhp and develops a peak torque of 192Nm, the oil burner offers a maximum of 126bhp and develops a peak torque of 260Nm. Transmission options for both the engines include a 6-speed manual gearbox and a 6-speed automatic unit. The Elantra then makes a strong statement in this segment and it's already crossed the 1500 mark when it comes to bookings. The customers are surely happy but so were our jury. So, congratulations to Hyundai then, for making a great car!